Given Fritz Stern’s seminal work that established in post-war scholarship Paul de Lagarde’s (1827-1891) importance for the development of racial nationalism in Germany, placing him alongside Julius Langbehn and Arthur Moeller van den Bruck as a leading proponent of ‘cultural pessimism’, it is perhaps surprising that it has taken so long for an examination of his life and work to appear. As such, Ulrich Sieg’s study of the German biblical scholar and anti-Semite is an important contribution to intellectual and cultural history. It is more than a conventional biography, providing a new and useful understanding of both his life and work and his reception in Germany into the twentieth century based on a wide range of new sources. These include not only Lagarde’s personal papers, correspondence and extensive publications, but also, for example, contemporary reviews and commentaries, as well as university archives and the memoirs of Lagarde’s wife and contemporaries. Thus, Sieg’s interpretation of Lagarde recognises his contribution to the development of nationalist thought in Germany, but also presents a more differentiated picture of his ideas in the context of his time than has previously been available. The first chapter of Sieg’s examination bears the title ‘Ein Mann der Widersprüche’, and indeed one challenge of dealing with Sieg’s subject is negotiating the many contradictions of Lagarde’s character. This book describes a man who never succeeded in overcoming his unhappy childhood, in spite of a happy marriage, and considerable academic success. The early chapters of the book provide an overview of Lagarde’s early life, thus laying the groundwork for an analysis of his thought, with all its contradictions. And here is one of the great strengths of the book: it is not overwhelmed by these contradictions. Instead, without overemphasising the ultimately intangible realm of psychology, Sieg offers interesting insights into the way in which Lagarde’s character informed his thinking. He rejects the view of Lagarde as the victim of the academic system in the Kaiserreich, overlooked in his efforts as a precocious young scholar to gain a professorship. The roots of this myth, it is shown, can be traced back to Lagarde himself, who adopted and even nurtured the position of the misunderstood outsider in the academic world. What emerges from this book, on the contrary, is the picture of a professor who, in the end, enjoyed not only a prestigious position at the University of Göttingen, but also international respect and considerable influence that allowed him to propagate his ideas. It is tempting to view Lagarde’s academic work as somehow parallel to his ideological development, most famously represented in his attempt to develop a national religion in Germany. This was presented in his best-known work, the ‘Deutsche Schriften’ (1878). Sieg’s skilful tracing of how Lagarde’s scholarly efforts informed his worldview provides a differentiated view of Lagarde’s ideas, which did not always succeed in reconciling anti-Semitic conviction with positivist scholarship. By extension, the book presents a complex view of the German ‘Bildungsbürgertum’ during the nineteenth century, which provided Lagarde with a readership beyond the walls of academia. Here Sieg demonstrates the contradictory nature of Lagarde’s own personality and his cultural environment; Lagarde was the product of the ‘Bildungsbürgertum’, but his cultural criticism also provoked strong reactions within it. Sieg wisely seeks no solution to these contradictions, but portrays Lagarde as both a reflection and an influential and controversial articulator of a wider nationalist ideology. Thus, although the title of the book highlights Lagarde’s anti-Semitism, his antipathy to the Jews is described in this book as one component part of the development of this worldview. It was in this context that his self-imposed position as an outsider, both academically and socially, allowed him to nurture a critical attitude towards society. Consistent with his acceptance of Lagarde’s contradictions, Sieg’s wide-ranging analysis of his professional relationships, which provides an enlightening perspective on the history of German universities in the nineteenth century, includes contacts with Jewish scholars. At times on the receiving end of his anti-Semitic passions, many nonetheless respected him as one of the most accomplished scholars of oriental languages, including Hebrew. Lagarde’s concern about the existence of a Jewish ‘nation within a nation’ did not remain abstract; among the targets for his virulent anti-Semitism were a number of Jewish colleagues. Yet his judgements were not always negative, and this book includes instances in which he judged the work of Jewish colleagues positively. In marked contrast to an outright endorsement of biological racism, which precluded such an eventuality, his recommendation in 1878 of the philosopher Jacob Freudenthal to the Prussian Ministry of Culture for a chair in Breslau was accompanied by the suggestion that Jews could be integrated into the German ‘Volk’. Sieg shows that Lagarde’s position towards the Jews demonstrated a certain flexibility, and allowed for different responses to the abstract ‘Jewish question’ and the actual situation of a gifted scholar in his own field: thus, when convenient Lagarde distinguished between educated Jews who made efforts to become part of the German ‘Volk’ through baptism, and other Jews. 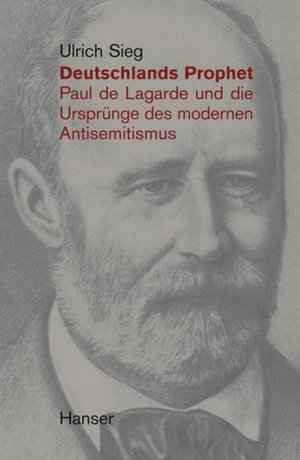 Lagarde’s views regarding the Jews were, as Sieg makes clear, not unusual and the effective contextualisation of his subject in the wider intellectual and ideological climate of his time makes this book a useful contribution to the scholarship on modern anti-Semitism in Germany. It provides a close examination of the motives and forms of Lagarde’s antipathy towards the Jews, presenting them as a response to processes of modernisation in the second half of the nineteenth century. The way in which anti-Semitism was incorporated into his more general cultural criticism is demonstrated throughout, lending weight to Sieg’s early observation that ‘Lagarde tended to be seen as a vociferous cultural pessimist of the Fin de siècle, rather than as an anti-Semite’ (p. 20). Lagarde’s cultural pessimism was articulated in his call for the renewal of Christianity to create a vital spiritual force that would counter the materialism he identified in modern Germany, and challenge the forms the institutional churches, both Protestant and Catholic, had developed over time. In doing so, he called for a national religion that made the nation the defining category for religious experience. This is an area which has already been described by Fritz Stern, but Sieg’s work provides an impressively detailed analysis of the sources available. Not the least of his achievements is a close study of successive editions of the ‘Deutsche Schriften’, which Lagarde revised in order to strengthen his attack on the Jews. In his analysis of Lagarde’s significance for the development of the Nazi ideology Sieg’s empirical approach also pays dividends. His analysis, for instance, of Hitler’s annotated copy of Lagarde’s ‘Deutsche Schriften’, an edition published by the Julius Lehmann Verlag in 1934, is not only striking evidence of Hitler’s reading habits, but allows us to see how he responded to Lagarde’s work as supporting his existing prejudices. The inclusion of several facsimile pages from this copy of the work is an example of the way this book addresses Lagarde in the intellectual and cultural climate of his time without ignoring the significance of the transmission of his ideas to later generations of German nationalists. Fritz Stern, The Politics of Cultural Despair, Los Angeles 1961; on the history of Lagarde’s impact and reception see also Ina Ulrike Paul, Paul Anton de Lagarde, in: Uwe Puschner / Walter Schmitz / Justus H. Ulbricht (eds. ), Handbuch zur “Völkischen Bewegung” 1871-1918, Munich 1996, pp. 45-93. Guy Thomas Tourlamain: Rezension zu: Sieg, Ulrich: Deutschlands Prophet. Paul de Lagarde und die Ursprünge des modernen Antisemitismus. München 2007 , in: H-Soz-Kult, 28.01.2010, <www.hsozkult.de/publicationreview/id/rezbuecher-9448>.